February 23, 2018 (JUBA) - South Sudanese oil minister has rejected a proposal calling on President Salva Kiir to stepping down in order for peace to be implemented and prepare the country for elections at the end of the interim period. “For us, this is a nonstarter. 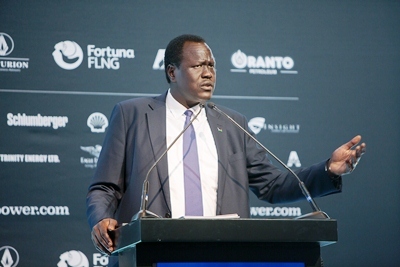 We want President Salva Kiir to continue, First Vice-President Taban Deng Gai, Vice President James Wani to continue and expand the government so that everybody is brought on board,” said Petroleum Minister Ezekiel Lol Gatkuoth. The former rebel official turned pro-government supporter and became a minister following the ousting out of the former first vice president Riek Machar in 2016, said the government was interested in expanding the cabinet so that everyone was given the assignment to help bring peace and end the war. “For us, we want everybody to be brought on board so that we share responsibilities of bringing peace to the country. People who are interested in running, they can run during elections,” said Gatkuoth in an interview with the BBC Focus on Africa on Thursday. The SPLM-IO faction led by Taban Deng Gai and President Kiir himself are opposed to the participation of the former First Vice President Riek Machar in the transitional government saying he would obstruct the process. However, they welcome the participation of the members of his group in the transitional government. The minister said the citizens of his home region, Upper Nile, were returning to their homes because the situation was getting back to normal. He claimed 90% of the area was now peaceful. “People are actually being told to come back home and they are coming. They are returning and we are stabilizing the situation of the economy; it is booming, I can actually guarantee you that,” he claimed. He said that the Ministry of Petroleum is working to “make sure that the money we are getting from oil is actually used for providing services”. When the South Sudanese crisis erupted in December 2013, Minister Gatkuoth was part of the SPLM - former political detainees. After his release, he joined the SPLM-IO of Riek Machar before to defect and join Taban Deng Gai.